I can’t help but wonder how long it will be before the movie title “Dial M for Murder” becomes mysterious to most of the population. After all, who has seen a dial phone lately? Sure, there are a few retro phones, but they aren’t in widespread use. It may not be murder, but it turns out that the dial telephone has its roots in death — or at least the business of death. But to understand why that’s true, you need to go back to the early days of the telephone. Did you ever make a tin can phone with a string when you were a kid? That dates back to at least 1667. Prior to the invention of what we think of as the telephone, these acoustic phones were actually used for specialized purposes. We all know that [Alexander Graham Bell] made a working telephone over a wire, drawing inspiration from the telegraph system. However, there’s a lot of dispute and many others about the same time were working on similar devices. It is probably more accurate to say that [Bell] was the first to successfully patent the telephone (in 1876, to be exact). A telephone by itself isn’t very useful. You need at least two. And that’s how the early telephones worked. You would put one phone at home and another in your business, for example. Or two offices might have a telephone, allowing them to communicate. In the same year that [Bell] patented the telephone, [Tivadar Puskás] was working for [Thomas Edison] on a telegraph exchange — a switchboard that allowed different telegraph stations to interconnect. 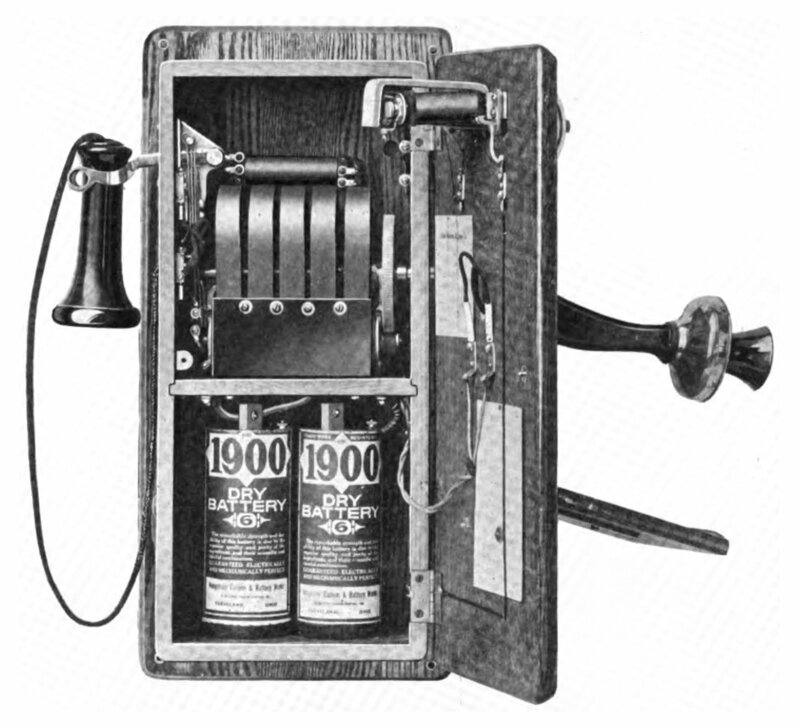 He realized the same technique would be useful for a telephone and, in 1878, The District Telephone Company of New Haven went into operation with 21 users. For $1.50 a month, any of those users could call one of the others. 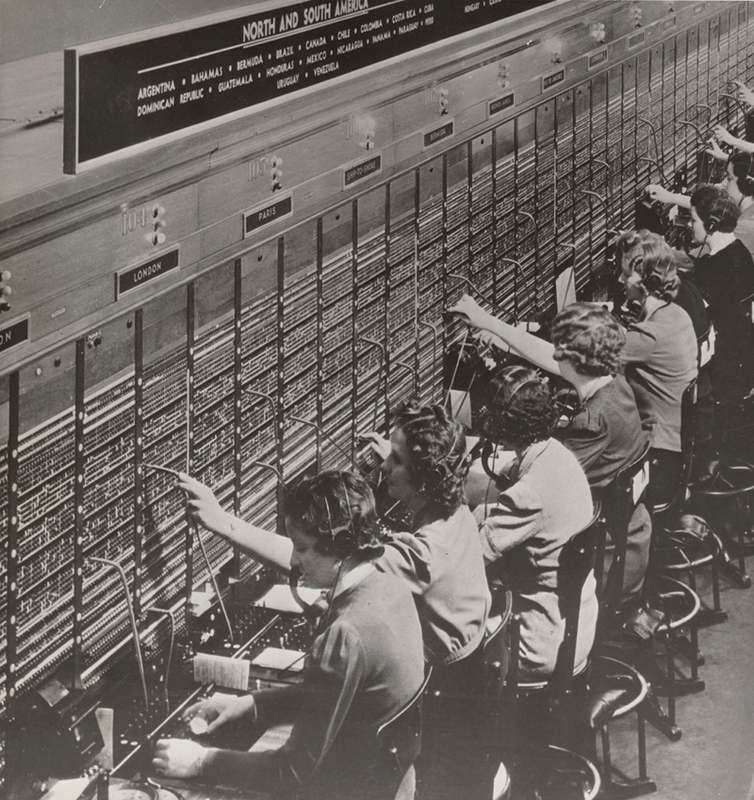 The switchboard, designed by [George W. Coy] could handle 64 users, but only two connections at once. In a month, they published a directory with 50 subscribers. London’s Telephone Company Ltd formed in 1878 with even fewer initial subscribers. However, an operator had to work the switchboard, making up to six connections per call. With 20 or 30 phones, not all of which would be in use at once, that was manageable. You’d pick up the phone and tell the operator who you wanted. They’d make the connections required on your behalf. In the early days, you’d let the operator know you wanted assistance by whistling into your phone! Eventually, a bell was put into phones. Early phone systems often had multiple wires to accommodate things like the bell. There is an obvious problem, of course. If you had thousands of phone lines, you are going to need a lot of operators. However, in a time when labor was cheap, that wasn’t what motivated the invention that would put most phone operators out of business. There is a less obvious problem discovered by a man named [Strowger] You might think that [Almon Brown Strowger] was some electrical engineer and an expert in telephones. But, in fact, he was an undertaker in Kansas City. In 1888 [Strowger] was frustrated. People would pick up the phone and tell the operator they wanted “the undertaker” or “the funeral home.” The problem was that [Strowger] had a competitor and the competitor’s wife (or girlfriend, depending on the source you read) was one of the phone operators. You can imagine that if a caller wasn’t specific, she was going to connect the call to her husband’s business. Who Has Time for Multiple Button Presses? You can read [Strowger’s] 1891 patent that covers how he solved the problem. You’ll see that it used a set of buttons, one for each digit and another to hang up. So to “dial” phone 46, you would press the first button 4 times, and the second button 6 times. A third button would hang up. While this doesn’t resemble the dial phone we know, the elements are all there. The only difference is that the dial creates the multiple button pushes automatically. [Strowger] formed a company, the Strowger Automatic Telephone Exchange Company, and worked out the dial and a way to avoid having a separate input for each digit. They also invented the busy signal. Not only was the system convenient and economical, but unlike other manual and automatic exchanges, it was technically very easy to expand the system to handle new phones. That scalability ensured its success, despite [Bell’s] efforts to stop the fledgling company. [Strowger’s] company was eventually sold to GTE and after many years of changes, is now a part of Alcatel-Lucent. By the way, [Stowger] sold his patents for $1,800 and then sold his share in one of the subsequent companies for $10,000. In 1916, the patent sold for $2.5 million — a staggering sum in those days. You can see a Telstra video showing a reasonably modern Strowger switch in operations, below. You’ll find these are sometimes called SXS or step-by-step equipment. As late as the 1970s, there were still a few operator-connected exchanges left. AT&T’s history center has a short film that shows what life was like for a telephone operator, that you can see below. When something is used for many years by many people, it often results in design changes that can be very subtle but important. After World War II, much of the rural parts of the United States were not connected to the phone system. But as people left the cities to move to the suburbs, they wanted phone service. Most phones at the time didn’t have the range required and the phone company was unwilling to create new central offices for just a few rural subscribers. Instead, the phone company commissioned industrial designer [Henry Dreyfuss] to create a rugged phone: the Model 500. The iconic desk phone had several improvements, but one, in particular, stands out. Previous phones had the numbers under the dial (like the giant phone in the video, below, or the model 302 to the right). Repeated dialing would wear the numbers off. The Model 500 (left) had the numbers outside the dial and tests showed a 50% reduction of misdials because of this change. Over 80 million of these phones were made and many are still in service. It is hard to imagine, but in the 1940s, the dial was new-fangled and exotic. The phone company made some propaganda films to show how “yummy” it was having a dial phone, like the one below. Dial phones eventually gave way to tone signaling and keypads, but most regular phone systems will still accept pulse dialing. You probably won’t get it to work on voice over IP lines, though. If you have the urge for some retro decor, you can still buy rotary phones (BoldOldPhones is one site that specializes in them). Despite being a relic from the past, we still hear phrases like “dial 911” and I have to wonder how long that will last. You can read more about [Strowger] at the aptly-named strowger.net site. Those interested in the history and technology of the phone network have a great book to finish off their summer reading. And if you want to see something more hackish, check out the video below. [Glasstronic] takes a surplus German switch and shows how it works with an old phone. Or you could always dial Bluetooth. When I worked for GTE labs in Phoenix, AZ, they had a display in the lobby with the story of Strowger’s invention. It claimed that the operator would even falsely tell callers that his line was busy and then offer to connect them to the competition! Nice history overview HaD. Maybe a follow-on about how switched telephony networks actually work, and a treatment of Erlang traffic analysis. Yes, and perhaps add how landline phones are heavily regulated in terms of capacity, and how the incumbent (primary) carriers are mandated by law to be able to provide simultaneous service to ~10% of their subscribers. This is why the telephone networks are so robust. It takes a great deal of equipment to carry conversations for 1 million people across the country. This also ties into how wireless networks and IP networks are not regulated the same way, and how there is constant wireless congestion resulting in “network unavailable” messages. There is also no mandate to provide paths for IP connections in the same regard as landline calls. Which is why your cellphone can drop calls routinely and no-one cares. And why your webpage can fail to load and no-one cares. It is interesting to look at from an obsolescence point of view. Their core infrastructure has migrated to packet and IP, so there is a massive shift to less and less phone traffic, freeing this IP-based equipment for data traffic. This mixed with the backbone upgrades means that there is more and more capacity for internet traffic. traditional landline calls make up a minuscule percentage of traffic in a modern exchange. There is a large lobbying arm that really doesn’t want regulation in the wireless space, because it would become “nearly” impossible to maintain that capacity. There is only so much spectrum, and competing carriers would need to cooperate and share spectrum to even have a chance of coming close to those numbers. Not to mention that it would essentially guarantee net neutrality, and cost billions in infrastructure that would make it better for us while being expensive and force cooperation for them. Not exactly their ideal scenario. There exists/existed a small paperback book, with a light-purple cover, which used to be considered ‘the bible’ of “step-office” (step-by-step, or SXS) operation. With the advent of Common Control, SXS died, as I’m sure this book has; but I’ll see if I can find a reference for you. I forgot to say–when you got through reading this book (and, yes, it had all the schematics), you knew everything you’d ever need to know about how a step office operates, and how to design for and troubleshoot a SXS system. I should never have thrown my copies away. I’ve noticed a lot of legacy technology terms in telephony that make no sense today. We “dial” phones that have no dials. The icon on mobile phone app indicating “voicemail” is a pictograph of a reel-to-reel tape. Microphone icons depict an RCA 77B, which haven’t been made since the 1960s. We “hang up” phone calls by going “on hook”. But what would replace these that makes any more sense? Pictures of 1s and 0s? LoL, You need a Gameboy and Walkman with a VHS player as well in there. This is just how language works. “&” this symbol meaning and gets its name “ampersand” from when it was the last letter of the alphabet. It has “and” like twice in it. Children all over England would finish their alphabet recital with “and per se and”. Soon this became ampersand. The telephone company called the “#” an octothorpe, the “=” a “quadrathorpe”, a “-” a “bi-thorpe”. Everyone knows that ! is a pling. “In computing, the exclamation mark (sometimes called a “bang”) corresponds to ASCII character 33 (21 in hexadecimal). It is therefore found in Unicode at U+0021 ! exclamation mark. The inverted exclamation mark is found in ISO-8859-1, 9 and 15 at position 161 (A1HEX) and in Unicode at U+00A1 ¡ INVERTED exclamation mark. The whole concept of a “call” also comes from antiquated concepts seldom-used. To get a call meant someone was visiting for conversation. This was extended, to when you receved a telephone call. When calling in person fell out of style, use of the term shifted to the abbreviation of telephone call, or call. You’re beginning to sound like a broken record! I miss those old rotary phones. It made you feel like you were really doing something when making a call…..shhhhhtttt..dit..dit…dit., shhhhhhttt ..dit…dit., etc. Also, hanging up by slamming the phone down really meant something. Now…it’s: “Oh yeah? Well take this!” End Call. Nice piece and I enjoyed reading it. When I was in the Air Force one of my coworker got fed up with “job control” (MOC) and slammed the handset on the desk several times before hanging up. 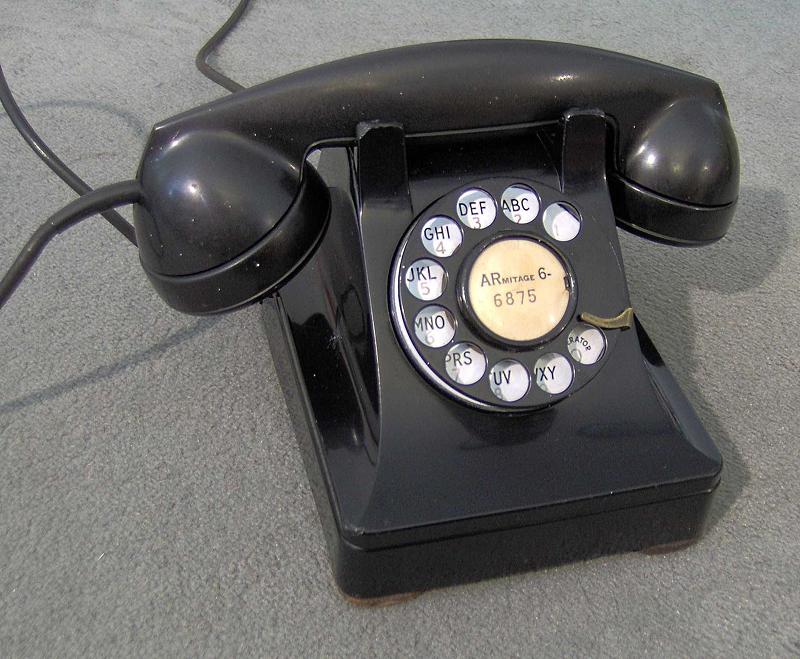 At my first assignment we also had a ring down phone (“the Bat Phone”), which was of course the traditional red color. Not to mention the super-cool one-handed chop-down-and-catch-the handset move. Leading to early failure of the main body, of course. I’ve said this before — there’s a lot of engineering behind the POTS system. And reading some of the old BSTJ articles will drive home just how engineered the system was. It’s pretty much bomb proof. And hurricane, tornado, brushfire proof, too. If not, easy to repair. And the people who used to work for The Phone Company were pros, hard workers who gave extra effort to keep the customers connected. I knew a couple of them and they were dedicated professionals who took pride in their work. Years ago, when working at an ISP and telco, I read a copy of a telco trade magazine. In it was an article about a small telco that owned and operated the last remaining in use section of the very first transcontinental American phone line. It was suspended over a highway and they were going to cut it down. Called up the local police to have them block the road for a few minutes while a couple of phone company workers climbed ladders with wire cutters. Snip-snip and drag the wire off the road. Would take five minutes, tops. But the highway was an *interstate* highway so that wasn’t *right*. Fire department and a host of other government agencies had to all be present and required much time for coordination etc – for a five minute job. The telco did keep a section of the wire along with an old switch setup so people could make a call across a room and say they’d made a call over the original transcontinental phone line. Pro like CBF unrolling 10m of cable from a reel so leave the reel under the house or in the roof such pros. Repairing their expert antenna installs or camera installs were the best they could not be bothered carrying cable out from a place would hook up from centre then run it nail it down and run away. About “dial”… A couple years ago, I got interested in what the original meaning was. It turns out to have quite a crazy evolution. It originally was from some ancient form of “day”, as in sun dial, with the connotation of measuring. The roundness was just a side-effect. Now both roundness and measurement are a bit passé, like the “dial” on my radio tuning buttons. We recently found a used Mitel switching unit to hook up our 6 station phone setup, the first one lasted 25 years. It”s used in our store and shop. They are all pre-model-500 Bakelite cased antiques. GTE models, northern electric mostly. Switchboards lasted longer than that. The last switchboard I used was “Death Valley 2000”, located in Stove Pipe Wells. That was in the 1990’s no less. When ATT had the monopoly. telephone equipment–both for the subscriber (youandme) and the central office (Strowger switches, e.g. )– had to be designed for a twenty-year service life. It is said that before Bell Labs released the 2500 (‘touch-tone’) set to Western Electric for production, it had been in design at Bell Labs for a time priod approaching ten years. I own three of the 2500/500 sets (500 is the “dial phone”), not because of any nostalgia, but simply for use in a doomsday scenario. To use a common phrase, “They Just Work”. Whenever my (fax) land-line starts ‘acting up’, I never have a problem getting repair service when I report that the line “…won’t work with a Bell 2500 handset attached…”. I’m ambivalent regarding the monopoly, but it seems that it sure had a lot of good aspects. Want to send a thank-you note to someone for the break-up? –Armonk, N.Y.: IBM. With my phone provider, all I have to do is call up and say ‘Shibboleet’ and I get connected to someone who knows at least two programming language. …and someone who has at least five Raspberry Pis in the basement, but who does not know that ringtone will kill you. Yeah, I have the same problem. That’s why I’ve got the ATT 500 handset…it’s smarter than most modern-day techs. I was taking it as a variation on “Shiboleth” with ‘leet added in. Very old reference. I like these articles on old technology, shows just how smart people were in the past. On and another historical tidbit, when they were first hiring operators they hired young(ish) boys, cheaper labour, but they had to replace them with women because the boys were too rude to the customers. I have always thought, for a long time, that Mr. Strowger was European; from one of the Nordic countries. Penfield NY is a village outside Rochester NY where the automatic voting machine was invented (1892) by Jacob Meyers. Maybe your’re thinking of Mr. Ericsson? The Swedes credit him with inventing the telephone. He didn’t invent the telephone? No, but he was helpful picking out the colors of the early phones! In the Netherlands, we got the T65 phones. No matter what market you go to, there’s always a minimum of 3 sets in great nick there. Bulletproof even. I prefer the Ericsson type 51. Bakelite just has a bit more class than that gray look the T65 had. But either phone is build like a tank that would win against a tank that shoots tanks. Why are computer numeric keypads 1-9 upside-down when compared to phone keypads? Computer KBs correspond to that of the numeric calculator, which has been used forEVER. [hearsay alert!!! ]: There was, supposedly, a major decision which had to be made by NASA regarding the keyboard layout of the Apollo’s (the spacecraft) computer; old calculator, or new, upstart touchtone phone? Old calculator won. Hearsay. Nothing more. No flaming allowed/aloud. I have heard that it was to force people who were familiar with the calculator/adding machine keyboard to actually pay attention to what they were dialing. Probably an urban legend. Great submission, [Antron], for both the information on the keyboard layout, and to show how seriously ATT designed everything with all possible science and engineering tools. Makes that ten-year development time of the touch-tone phone seem more probable. I’m so glad that “bowling pins” didn’t become the standard. Ever used one? They are an absolute nightmare to use AND write notes/take notes at the same time (I assume you refer to the “candlestick” telephone). They’re such a PITA that most people with a genuine working unit won’t use it even though, true to the Western Electric legacy, it works perfectly, and makes for a great show. But–they look good in the movies, and sitting around the house as a conversation piece/antique. Got one to sell? No, he? is referring to the Bowling Pin keyboard layout mentioned in the link above. I loved this article about the design of the phone keypad, thanks! John Dvorak wrote back in the ’80’s about turning your desk telephone “sideways” and placing your (right hand) index finger on the 2 button, middle finger on the 5 button, ring finger on the 8 button and the little finger (pinkie) on the Zero button. The thumb could rest in the cradle near the “off hook” button. With a little practice, one can dial without looking at the keyboard. Just look at the phone # you need to call and then either extend, retract, or directly press the numbers. The thumb can be used to hang up the phone and start another call. I found it very useful, and it is coming back to me as my office desk now has a similar phone. Mind you, supposedly his 1st business was run from a telephone box. Nice. Remember when I use to regularly take the phone apart. Hey those rotary phones work. The one at my house is almost 60 years old and still works fine. You won’t get that sort of life out of throw-away products like the Ipod or Galaxy. 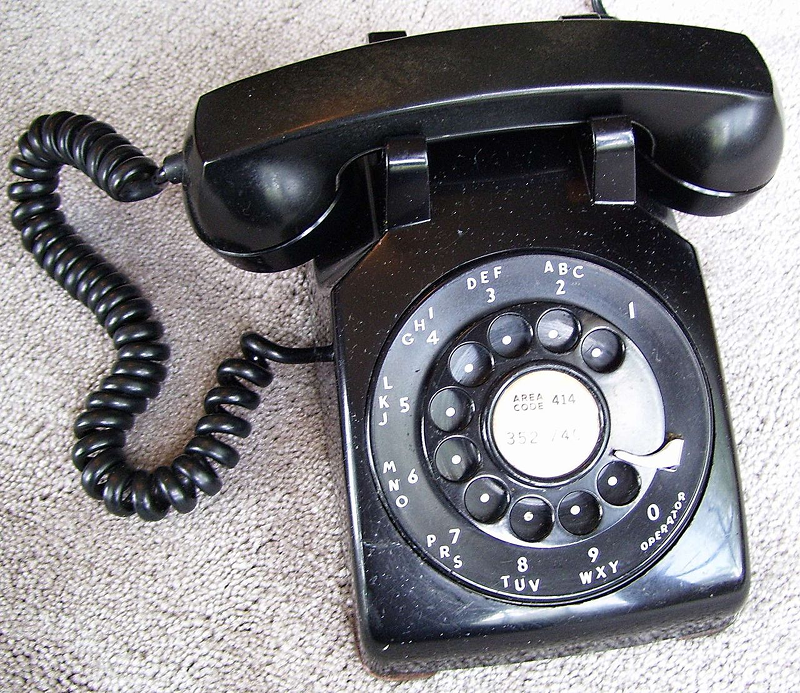 I bought a dial phone at a garage sale over a decade ago, it dials okay and rings loud, but the earpiece doesn’t work. I hooked it up in parallel with a newer unit in the shop. I can definitely hear the phone ring. Great article. Really enjoyed the videos too. Our landline is a 50’s bakelite black dial phone and the sound of incoming calls is wonderful and reaches all parts of the house. We pick up, talk, and make calls on the usual cordless things now. But from time to time I’ll make a call on the dial. I have to sit in the same place while I make it, and have to untangle the receiver cable when I’ve finished, but it’s still a wonderful piece of kit. Back before the AT&T breakup, they charged extra for additional phone extensions in the house. But the way they detected how many phones were on the line was through the impedance caused by the ringer coils. So the solution was to disconnect all the ringers except your one “official” phone and you could have as many extensions as you liked! I’m staring right now at a model 302. And yes the numbers are worn off. Yes it’s heavy but that helps keep the conversations short. It has the best audio of any phone in the house. And it’s bulletproof to rf — 100 watts of CW won’t even make a dent. I seem to recall that ‘short’ numbers were prized — businesses would pay a premium to have a number such as EDgewater 4 2111 which is much faster to dial than say LOngbeach 1 0789. Kindof like when they’d choose a business name like AAA Acme Auto so it would show up first in the phone book. Just remembered. Another term that won’t ever go away is ‘ring’. The old phones had actual bells that would actually ring. Nowadays, we have ringtones. … and a lot of people use a bell recording, which always tickles me. “Type 911”? “App 911”? You know there’s an app for that (well i don’t know if there’s one for 911, i come from 112 area myself). Why you wonder? Because it gives the emergency call center the GPS coordinates as well, so you don’t need to try to fumble with the phone while you are making the call. and, of course, there is the “ka-ching” of a mechanical cash register which is even more long gone than the ring of a telephone, but still used to indicate money. These icons and sounds have clearly now gained a life of their own. It would be interesting to have a dictionary of such sounds and icons that explain their origins for when nobody can remember any more. According to everything I read in this link, he already has been more than adequately remembered, not only by the United States, but by Canada as well. I read the book “Exploding the Phone” by Phil Lapsley a couple of years ago and really enjoyed it. It has a lot of detail on the old POTS system and how the original phreakers found and used ways to exploit it. It’s from the mid 1980s, so it still covers a lot of the old type of phone network in a lot of detail, but I found it extremely easy to follow. I just checked on Amazon, they still have a few used copies floating around. Scanned at https://archive.org/details/voicedatatelecom00gurr but I laugh at having to “borrow” a digital book. Thanks, [Red]; I’m going to get a copy. “There exists/existed a small paperback book, with a light-purple cover, which used to be considered ‘the bible’ of “step-office” (step-by-step, or SXS) operation. With the advent of Common Control, SXS died, as I’m sure this book has; but I’ll see if I can find a reference for you. The Western Electric 500’s had a rarely invoked option. You could order the bells in any note in the entire octave. It’s usually printed on the bell. Couple of the phone geeks I know have the whole set. A lot of things that I didn’t know about a fundamental device for our lives. Will do more research on Strowger achievements. Here in Italy we are told that Antonio Meucci invented the telephone.